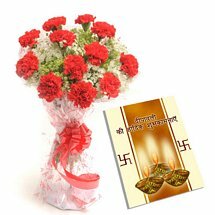 Buy Diwali artificial decorative flowers online at affordable rates. 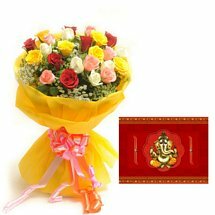 Check out our collection of Diwali artificial flowers decoration items and a range of beautiful flowers to choose from. Shop now! Diwali is the festival of lights that is celebrated all across the world by the Indians with great gusto and enthusiasm. It falls on the darkest night of the year and by illuminating diyas and candles the darkest night turns into the brightest night of the year. People cleans their house paint walls with new and bright colors and decorate with flowers, wall hanging, torans, Jhumar and much more. It is a belief that goddess Laxmi roams on Diwali night and only visit to the places that are neat and clean. Hence, people decorate their homes for welcoming goddess Laxmi to bring wealth and prosperity at home. When it comes to decoration then flowers are the first choice of everyone whether it is original or artificial. Nowadays you will also hardly be able to identify the difference between as they look so much similar to original ones. You can buy artificial online to decorate your home on this from this site where you will get vast varieties to choose from and can also send Diwali artificial flowers to India online as Diwali gifts for your loved ones. Flowers and festivals are deeply connected and when the occasion is Diwali then the significance of flower just doubles. Diwali is the peak time of celebration. It is the moment to rejoice for what we have and what we can attain in future. It is a fete of wealth and prosperity. People move out from selfishness and self-centeredness to exchange gifts, flowers, home decorative and sweets to each other on the happy occasion of Diwali. 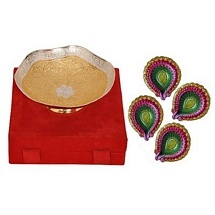 Gifting items of home décor is a tradition of Diwali. As we already have discussed that Diwali is the time to come together and celebrate hence everything is at its high on Diwali. Considering the relevance of flowers in Diwali, it is the heart and soul of the festival. Diwali is about decoration and no decoration is complete flowers, whether it’s in making toran, or decorating vase or making garland flowers are the prime element of Diwali decoration. The annual event of Diwali brings so much of happiness in life that everyone wishes to capture it for a long. Like the decoration of Diwali people want to stick to Diwali decoration till the arrival of the next. But making it happen with natural flowers is not possible for a longer time, plus there are many complications in finding natural flowers of different types and patterns in market. Still, this desire can be maintained with the help of Diwali artificial flowers. One can easily get beautiful artificial flowers online as well as in traditional markets. Buy scented, designer and beautifully adorned Diwali artificial flowers that gives you the feel of a natural one online at Elite Handicrafts. We are the exclusive e-commerce store where you can find an array of Diwali artificial flowers. So when you desire to find something very trendy yet so natural then visit us. We provide free shipping all over India. Every celebration, happy occasions and festivals has a deep connection with flowers. We Indians whether for worshipping or decoration, needs flower. In weddings or any other occasion people use flowers as decoration. In fact whenever it comes to decorate the very first thing that goes through our mind is flowers. Diwali is a festival when people decorate their houses like a new bride with lots of candles, diyas and other electric bulbs. And many use flowers, torans and door hangings to embellish the beauty of their home. There might not be anyone exists who doesn’t like flowers, the essence of flowers enchants everyone. Though natural flowers are beloved by everyone but this can never be preserved for longer. The freshness and essence of flower will fade away immediately hence you must buy artificial flowers online that can be preserved for longer and can also be reused. Here you will get vast collection of artificial flowers in variant varieties. We have artificial flower deity garlands, flower torans, flower latkans, flower wall hangings, floating flowers, artificial flower bunches flowers with vase, etc. You can use flower bunches in a pot to decorate your living room. The garlands are best to worship god and can be placed in god’s idols for longer period. The floating flowers are best to adorn your living room, you can place it a pot with fill of water and can also teem with floating candles to make it look even more beautiful. Flowers are like the inevitable part of a celebration or function. Whether for decorating or gifting someone, flowers are always opted first. So, this Diwali you can also opt for artificial flowers as Diwali gifts for your loved ones. With this they can also decorate or embellish their home and whenever they will see this will remind them of you. It is important to choose a useful gift for someone instead of a useless gift that stands in a corner. Diwali is the time to decorate homes. People clean and paint their houses and embellish with mesmerizing decorative items so opting for artificial flowers will be an ideal gift for your dear ones on Diwali. We have plethora of artificial flowers to choose from. Go through the design catalogue available at the site and pick the best one for your home or your relatives. 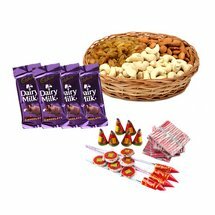 Teeming with delicious sweets or chocolate hampers you can make it even more special gift for your near and dear ones. Diwali the festival of lights is also incomplete until you share sugary delights with loved ones. 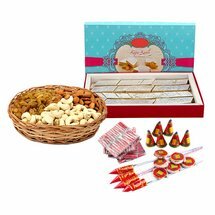 Considering this we have brought you delectable sweets hampers that are comprises of Indian sweets like Gulab Jamun, Rasgulla, Rajbhog, Kaju Katli and much more. Pair the mesmerizing artificial flowers with delectable sweets and send a wonderful surprise to your loved ones on Diwali from miles away.